Sweet potatoes are one of my favorite side dishes to make. On Pinterest I saw all these different recipes for “potato stacks”, and instantly knew I wanted to try them. 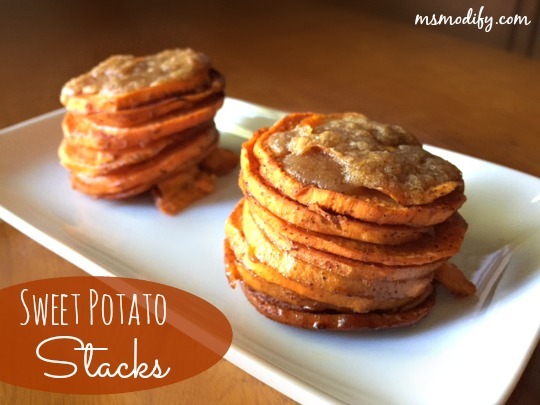 I made these sweet potato stacks over the holidays in place of a sweet potato casserole and they were a big hit! I love the flavors of sweet potato with cinnamon and sugar; I make them all year around… not just on holidays! They’re super easy to make, even easier to serve and taste delicious! Preheat oven to 375 degrees. Grease a 12-cup muffin pan and set aside. Combine oil, one Tbsp of butter, syrup, cinnamon and nutmeg in a small bowl. Stack potatoes in muffin tin to form little piles. In another small bowl, combine the salt, flour, brown sugar and the remaining 1 ½ Tbsp of melted butter. Stir mixture together and then place a small amount on top of each potato stack. Place in oven and cook for 45-55 minutes or until potatoes are cooked through and edges are lightly brown. This entry was posted in Recipes/Dining Out and tagged side dish, sweet potato. Oh aha! This is looking awesome! I will love to have this and try to cook this weekend. I am great fan of sweet potato so i can imagine how delicious will be this and i will enjoy cooking and eating this.